This is plate 16 from James Baillie Fraser's 'Views of Calcutta and its Environs'. Fraser (1783-1856) arrived in Calcutta in 1814 and in six years produced these animated sketches of the busy city, published later as a collection of twenty-four superbly aquatinted plates. 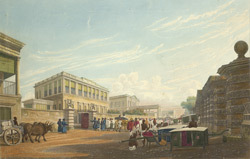 He included in this collection two views of the Lall Bazaar, "famous for its punch houses and other places of entertainment." From the junction with Mission Row, Fraser drew the view eastward down the length of the street. The grand house dominating the composition is the house of John Palmer, the so-called Prince of Merchants, which was sold shortly afterwards to the government and converted into a police station. Beyond it, on the intersection with Chitpore Road, is the house that served as a court for the Justices of the Peace. Opposite Palmer's house are the emporium and auction rooms of Taylor and Company.